NV Arena is a small 8,000 capacity purpose-built football ground which has been home to SKN St. Pölten since opening in July 2012. Designed by agn Niederberghaus & Partner, the stadium is famous for its circular roof shape and for the way it blends into the natural landscape. The stadium was inaugurated on 7th July 2012 with a mini football tournament between SKN St. Pölten, Austrian Champions SK Rapid Wien and Sparta Prague from neighbouring Czech Republic. As every match ended in a draw there was no winner, although the first competitive fixture saw the home side hammer First Vienna FC by a decisive 5-2 scoreline. Pictures of each stand to be added eventually. Away fans are housed within the north-east corner of the stadium within sections G1-G3 as per the above seating plan. Known as the Gaste-Sektor, visiting supporters stand in the northern stand with the home fans and tickets cost €10.00. SKN St. Pölten merchandise is on sale at all home matches and is available to buy from the official website. Tickets to see SKN St. Pölten can be purchased online, and at the ground just before kick-off on matchdays. 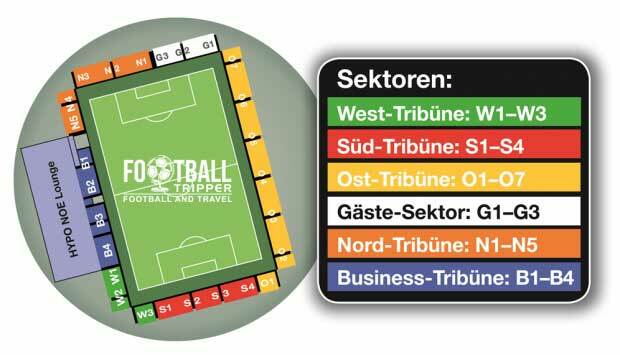 Please note that the above figures reflect ticket prices for matches of the Austrian First League and not Bundesliga. NV Arena is situated approximately 2. 5 km north-east of St Pölten’s city centre within the Ober-Ratzersdorf suburb. Whilst public transport remains popular amongst Football Trippers it is worth noting that the ground can be walked to in approximately 30 minutes. There are an estimated 800 parking spaces for vehicles across four car parks and enough room for an estimated 500 bicycles. St. Pölten Hauptbahnhof is the main railway station of the city with the stadium essentially served by “St.Pölten Traisenpark” station. One stop away, catching the train can certainly save time however don’t forget to factor in waiting time and walking distance to the stadium. The stadium is served by LUP Line 6 and 7 which departs from St. Pölten Hauptbahnhof. The buses have an increased frequency on matchdays and drop fans off right outside NV Arena. At a distance of just under 90 km away, Vienna International Airport is the closest major airport to the city of Sankt Pölten in Lower Austria. The majority of accommodation options within Sankt Pölten are to be found within the historic city centre in the around around the Cathedral. The most affordable option appears to be the three star Stadthotel Hauser Eck.